I stumbled across Kricket in my Instagram discovery page and had to go and try! I am so glad I did. Kricket is based at Pop Brixton and the decor in the restaurant is inspo from both English and Indian influences. The brainchild of friends Will and Rik, the speciality is delicious small plates and incredible, innovative cocktails. We started with the Samphire pakoras. These were just amazing. I had eaten samphire before but never as a pakora and this was just so good. Accompanied with wild garlic mayonnaise and date and tamarind chutney, this was a novel dish. Next was the Kadai spiced padron peppers served with pachadi and crispy onions. This was delightful and the flavours of the spices with the peppers were just wonderful. The presentation of this dish was awesome too. The next dish was my favourite from them all. Keralan fried chicken. Wow just wow! Quite possibly the best fried chicken I have ever had. I could easily eat a bucket of these! They come with curry leaf mayonnaise and pickled mooli. The mayonnaise was really tasty and again a combination I had never tried before. Innovative dishes! Finally we had some grilled lamb with black stone flower and smoked paprika raita. These were so good too! Full of flavour and felt like it was melting in my mouth. The raita was incredible too! Finally we had Gulab Jamun for dessert and this came with clotted cream icecream and carom seed crumble. Yummy! The carom seed crumble was just delightful! The flavours complimented each other amazingly. 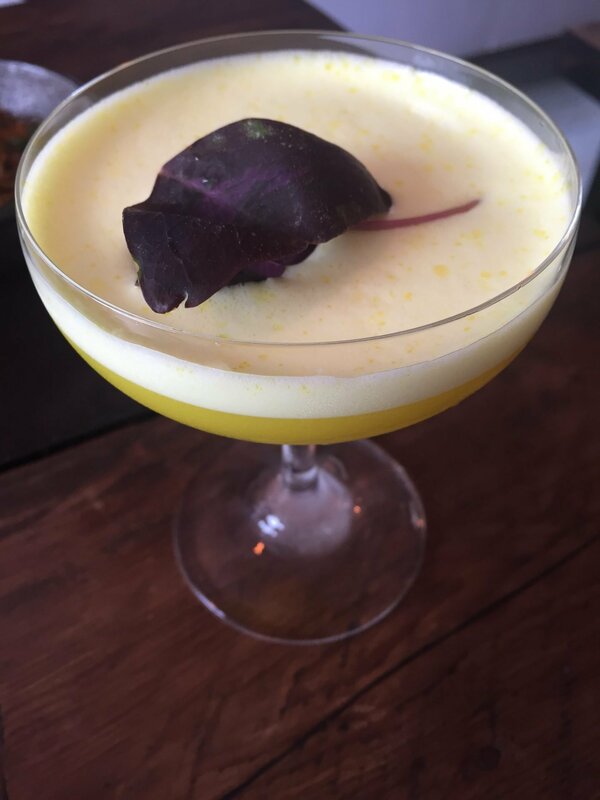 For drinks I went for a Yellow Fairy which was made from turmeric, absinthe, egg whites and gin. It was mind blowingly good! Once the drink was finised the flower was edible and it was delicious! Had a sweet taste sort of like plum! 1) What was the inspiration behind the restaurant and the background to your collaboration? Whilst living in India I was inspired by the cuisine and thought so much more could be done with it back in the UK. Indian food is full of heritage and is forever evolving. I thought of combining the cuisine with the best of British ingredients for create something unique. I started working on a business plan and started writing menus that were influenced from different culinary experiences I had. When back in the uk, Rik approached me about doing something together, and potentially combining the food with an innovative cocktail menu. I knew we’d work well together and from then we developed the idea together, wrote proposals and kept an eye out for the right opportunity. 2) Why the name “Kricket”? There is a theme running throughout the restaurant that draws inspiration from both Indian and England. From the food and cocktails through to the interior and design, we wanted to reference inspiration from both countries, and in a subtle way. This applies to the name. Cricket was invented by the British and mastered by the Indians. We liked the name and thought it would look better with a ‘K’ rather than a ‘C’! 3) What is each of your favourite dishes? Rik likes the bavette and my personal favourite is the grilled lamb. 4) What has the journey felt like so far since opening day? We are both very happy with the start we have had at the restaurant. The feedback we’ve had has exceeded our expectations and we are very happy people are embracing and understanding the concept. It’s something we’re both passionate about; it’s extremely tiring but very rewarding at the same time! Really recommend trying it for the amazing food and cocktails. Definitely something different and absolutely delicious! Big thumbs up from me and a 10/10 for food, flavour, ambience and hospitality.